This is what came about from an evening or two of knotting leftover yarn from my knitting projects. I’d cut these yarn lengths for another macramé project. That hadn’t gone as well as this one, and I’d abandoned it, salvaging the yarn that remained. The yarn is too thin by itself, so I used a bunch of same-color lengths for a single macramé ‘cord’. Also, the two colors are of different thicknesses and textures, so I compensated by choosing a different number of threads for bunches of one color, and a different number for the other color. To finish the piece, I made sections of double-half hitch knots to get all the cord bunches back to their original pattern. I then strung the bunches through some large-hole beads, and arranged the beads into two lines. I left the ends as is. 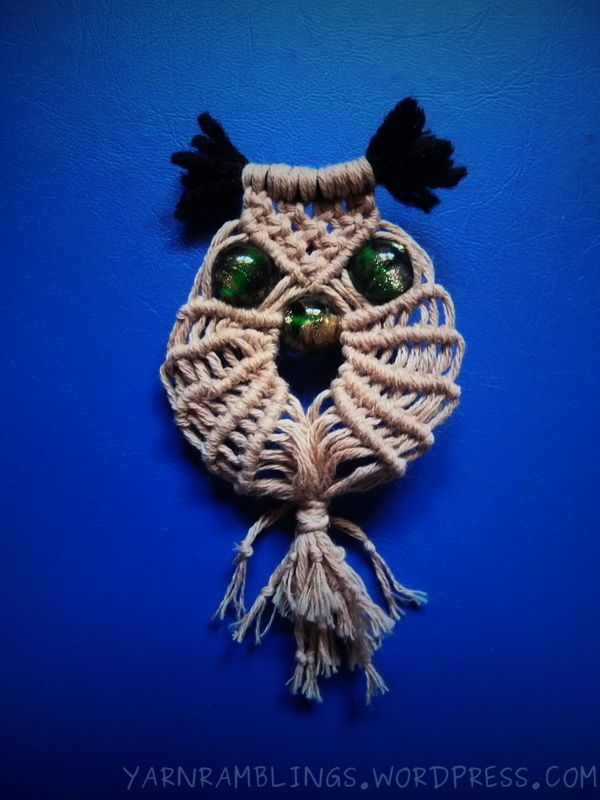 I’ve been meaning to post about this macramé owl that I made a while back. I discovered macramé many years ago, but I’d only been using square knots then. (I’ll post about stuff that I did using square knots some other time.) And then, I don’t really know why, but I didn’t do any macramé for a very long time. Until recently, that is. I rediscovered macramé a few months ago, and have been trying my hand at things, mostly jewelry. I also started a mega-project that I know I’ll take a reaaallly long time to work on slowly to completion. Meanwhile, I think it’s time I mention the owl that I made. I wanna make a giant Macramé owl some day. A monster owl is still cute, isn’t it?